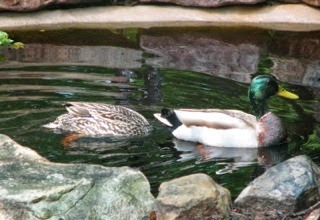 One Mother's Day we were thrilled to see a pair of Mallard Ducks in our small 5x8 frog pond. They were swimming in circles and diving for food which would've been our tadpoles, newts or baby frogs, but I didn't want to think about all of that. I was just enjoying the fact that we had Mallards in our little pond. They didn't stay for very long. The female walked out and the male followed. What a sweet treat for Mother's Day morning. Little did we know that they had left us a gift behind. One that would last forever and multiply rapidly .... Duckweed. Duckweed multiplies rapidly and can infest a small pond in a matter of days turning an otherwise beautiful pond into an unsightly mess. 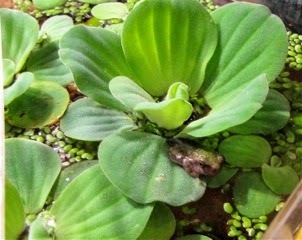 It is one of the smallest free-floating plants found around the world. Measuring 1/16" to 1/4" in length with fine roots extending about 1/2". 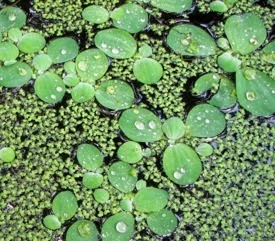 Duckweed floats on the pond surface absorbing nutrients from the leaf undersurface. We were having to scoop this stuff out on a weekly basis. Once it fills the surface of the pond it just grows a deeper and deeper layer of plants. It's possible for each Duckweed plant to reproduce into another every 24 hours. That means that in just two weeks, a single plant results in up to 17,500 plants which covers the entire pond surface depleting oxygen and blocking sunlight. If you have fish or submerged plants they can be killed. If you have submerged algae it will wipe it out. That's a nice free and simple solution to an algae problem, but it's really just an exchange of problems. 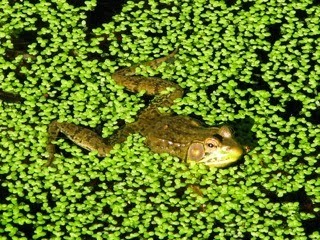 Duckweed competes with their growth by shading them and depriving them of the light needed for photosynthesis. We were blessed to discover that Water Lettuce keeps the Duckweed in control. Water Lettuce's early origins were recorded to be upon the Nile River. Experts disagree on whether Water Lettuce is native to the United States. It has been present in Florida as early as 1765 when explorer, William Bartram, described and drew the plant in Lake George. It is considered a weed with no wildlife or human food uses recorded, so be sure to keep it within the confines of your pond and not allow it into any public water source. It makes an attractive water feature that is very easy to control by hand-picking plants out of the pond when they become too dense. The rather spongy foliage has a unique texture and is light green color is pleasing to the eye. Water lettuce has very thick leaves that are hairy and ridged. There are no leaf stalks. Water lettuce roots are feathery and light-colored. The flowers are inconspicuous. The plant grows from 1-6 inches, multiplying by sending out side shoots of more plants. These show up in the form of velvety rosettes, which resemble small heads of lettuce. An evergreen, the long dangling roots serve as a safe haven for small fish and frogs. As our Tree Frogs go from being tadpoles into the form of a frog, they enjoy sitting in the shelter of the Water Lettuce leaves. Here in Central Virginia the Water Lettuce does not winter over. We buy 3 plants each Spring for less than $10 and they multiply as the weather warms. As they multiply the Duckweed begins to die off. 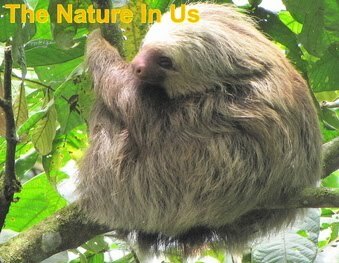 In Florida it is considered an exotic pest and has been listed on the Invasive Plant Species list. It forms large infestations preventing boating, fishing and other uses of lakes and rivers.